Google has improved its related searches to show fresher results – according to the search giant’s developer blog. Google has tweaked its algorithms to give people alternative searches that include current and ongoing events and news relevant to the original search. 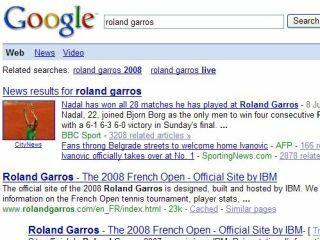 The upshot is that typing something like ‘Roland Garros’ into the search box will bring up related searches for Roland Garros 2008 and Roland Garros Live.